Your comment in the sermon that Jesus didn’t have His prayer answered regarding the “cup of suffering” made me think of a study I did on the Gospel of Mark. I’m sure I consulted some commentators, so this is just another opinion, but at least one of them suggested that the “cup” was really the cup of God’s wrath in which Jesus would become sin (II Cor. 5:21) and endure separation from His Father (Mark 15:34). Jesus’ request, according to an interpretation of Heb. 5:7-9, was that Jesus requested to be “saved out of death,” which is exactly what happened when He was resurrected. To me, that is a little bit of a stretch, but the other factor is that Jesus, in all His recorded prayers in the garden, asked that God’s will be done, even though He knew it would involve suffering (e.g. Matt. 26:52-54; John 18:11). In the sense that Jesus’ prayer ultimately was for God’s will, couldn’t we say that ALL of Jesus’ prayers were answered? I don’t know if it matters whether all of His prayers were answered, but it seems to me it’s important, since Jesus would have been “abiding,” and doing all the things recorded in I John 3:21-24. Of all people, I would think that Jesus would model prayer perfectly, while at the same time expressing human emotions in His prayers, so that we know it’s okay to tell the Father what we REALLY think. Ha! I so love your sermons, James. I know you work hard on them, and I am taking notes because I want to continue to grow while I still have a semblance of a mind! Those are great thoughts, Kathy. Indeed, the caveat that Jesus made was indeed “the will of God.” I’ve often thought that the comment in Hebrews. 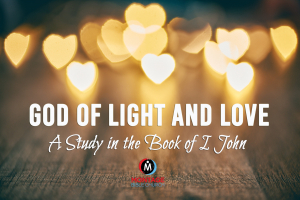 “for the joy that was set before Him endured the Cross” was a reminder that it wasn’t His suffering which brought Him joy, but what His suffering would ultimately accomplish…fellowship with us and satisfaction for His Father. So, yes, all His prayers were answered, even those which had an intentional caveat. The cup wasn’t removed, nor could it have been. He didn’t bypass suffering; He entered into it. Had there been another way He could have taken it. But the destination Jesus took only had one road that could be traveled…and He took it for us. What a blessing!